Setting personal boundaries are like identifying the gates in our invisible fence lines which protects the precious heart and soul inside our bodies. 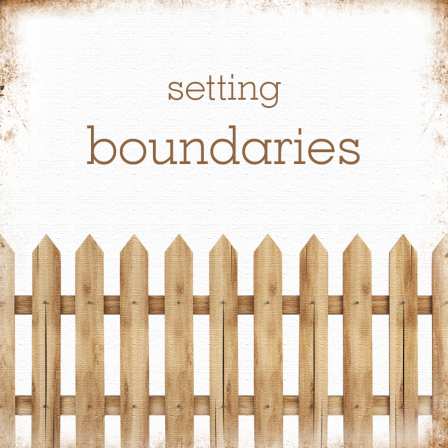 Many people look at boundaries as walls, but rather when we establish healthy boundaries it provides a way to distinguish what we choose to let in and let out. They form flexible gates, not stationary walls It is important to learn about setting healthy boundaries so we can make decisions about what is and what isn’t permissible in all relationships. All relationships work more harmoniously when the participants know what to expect and what is expected of them. Being kind, but firm when stating what you need from a relationship allows the other person to reciprocate. How other people act and think often has nothing to do with you, but rather with their own perceptions. You can only take care of yourself. It doesn’t matter how elaborate the fencing and eloquent our statements are, if we don’t honor ourselves enough to draw the line and stick to it consistently. It is just as valuable to the other person that they learn how to be with you and what the guidelines are for the relationship. Verbal communication is the language of information and only 20 % is absorbed. Body language and tone of voice is the language of relationships and 80% is remembered. Make sure you appear confident and you speak with a neutral, calm and non-accusing tone when establishing your boundaries. Use “I” statements which reflect on how things affect you, rather than “you” statements which put people on the defensive. 2. Request that they honor your boundary. “I ask that you talk to me without yelling.” Or ..For me to listen and hear what you are saying to me, I need to you speak to me in a calm voice without yelling. You can not assume responsibility for other people’s feelings, agendas or methods of communication. You can only state how you desire to be treated in life. If there are old patterns, it may take some time to convince others that you are serious about sticking to your boundaries. Everyone has the right to be treated with respect and courtesy. People you know may be surprised at first when you tell them they have crossed the line, but will respect you more in the end. Hopefully, they will model this communication style and it will make for more honest and open relationships for all. 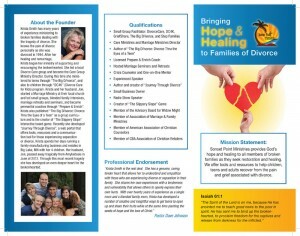 Judy H. Wright is an author of many parenting and family relation books and articles. Ezines, blogs and monthly specials as well as books, workshops, CDs are available at her website: http://www.ArtichokePress.com To schedule a training session, writeJudyWright@ArtichokePress.com or call 406-549-9813.